As per the notification released by the CBSE (the body conduct JEE Main Exam every year) that from the year 2019 JEE Main Exam will be held twice in a year. Now, students have an opportunity to get admission into their desire engineering colleges or University. Greater Opportunity requires more efforts. Now, students need to bring more efforts for the preparation of 2019 JEE Main Exam. This is a time when JEE Main aspirants must study in Smart Manner. Hard Work is important but smart work will double your chance of clearing the JEE Main 2019 Exam. 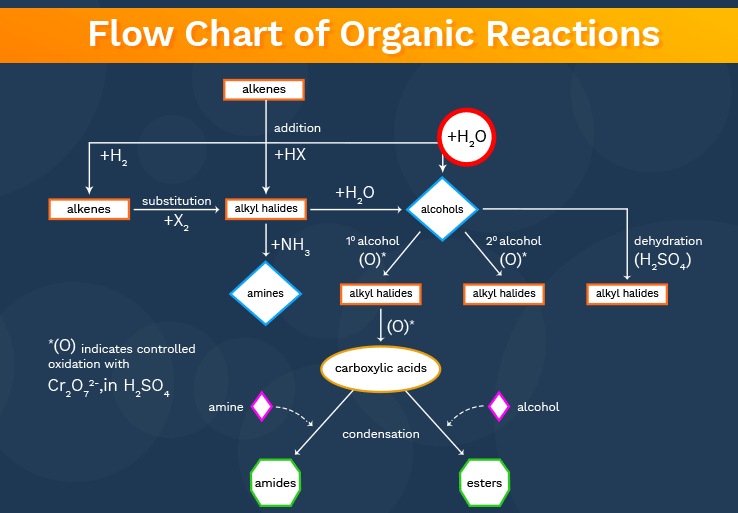 Organic Chemistry is subject where students often find great difficulties while remembering the Name reaction, reagents used during the reaction or conversion of name reactions. All these things create a big confusion. So here I am going to provide you Simple but effective tricks which helps to score better marks in organic chemistry in JEE Main Exam. 1. Haloalkanes can give you every possible functional group. They can also help you in increasing the chain size. So you might want to convert your starting material to haloalkanes and then go to the desired product. 3. Strong oxidising agents are KMnO4 and K2Cr207. 4. Mild oxidising agents depending on the situation are Cro4, Ammoniacal AgNO3, Benedicts Solution, Fehling’s solution, Cu or CuO at 573K, Bromine water etc. 5. Any carboxylic acid derivative can be converted back to carboxylic acid by hydrolysis. 6. There are possibilities of hydride and methyl to get the most stable intermediate (carbocation/free radical). 7. The most common reaction, if your starting material is an alkane, is free radical halogenation. 9. Decarboxylation and ozonolysis could go to methods for decreasing the number of carbon atoms. 10. Grignard reagent gives you the much-needed Alkyl nucleophile, which can be used at appropriate places.